Since my calendar application is integrated into many different existing web sites, I had a need to support a calendar look that is very plain and goes with many other colors. 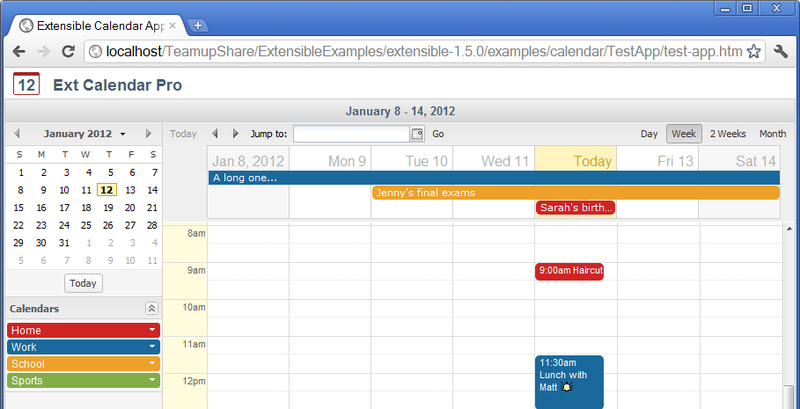 The ExtJS framework already supports a gray skin but the Ext Calendar does not so far. Therefore, I created a small extension to Ext Calendar that adds support for the gray skin. Maybe some of you find this useful as well. Note, that this is for Extensible 1.5.0 only! The skinning is achived with an additional small style sheet that overwrites some of the existing styling, plus three images. These are attached below. Save these files to directory resources/css/ inside your copy of the Extensible distribution. Save these images to a directory resources/images/gray-theme/ inside your copy of the Extensible distribution. This link tag must be inserted after the link tag that loads the extensible-all.css style sheet. Awesome Gabe, thanks! It's been on my list to add support for the official Ext themes (Slate and Accessibility as well, and soon Neptune...), just haven't gotten around to it yet. This should be really helpful to others. Thanks Gabe! This will be really helpful. I was just trying themes with Ext JS and realized that I couldn't theme the calendar.